Cologne - With half of the Bundesliga still harbouring justifiable ambitions of European football next season, that leaves the other half fighting it out for their future in Germany's top flight. A clear division appears to be opening up heading into the final eight games of the 2014/15 Bundesliga season. With a rejuvenated Borussia Dortmund joining the battle for a place in Europe next season, those who have been left behind know they have a scrap for survival on their hands. From 1. FSV Mainz 05 in 11th down to VfB Stuttgart in 18th, seven points separate eight clubs, two of whom will be dropping down to Bundesliga 2 in May with one more facing a play-off to stay up. bundesliga.com looks at the state of play in one of the fiercest fights for survival in recent years. Of the teams still in relegation danger, 1. FSV Mainz 05 (and 1. FC Köln) are currently the closest to what is widely regarded as the magic 40-point mark. That is the target set at the start of the season for those clubs whose priority is maintaining their status as it generally ensures survival, and 2014/15 looks like it will be no exception. For Martin Schmidt's Mainz, therefore, just three more wins and a draw from their last ten games should see them through, but considering they face the likes of Bayer 04 Leverkusen, FC Schalke 04 and FC Bayern München between now and May, that remains a big ask. 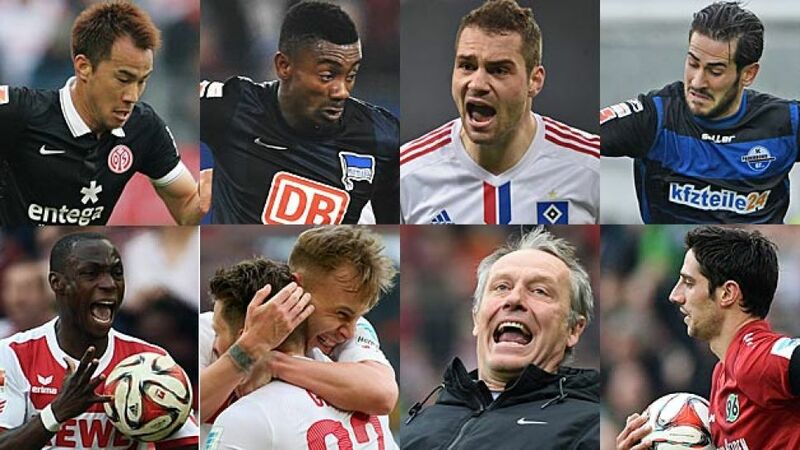 The direct battles with SC Freiburg on Matchday 29, Hamburger SV on Matchday 31 and 1. FC Köln on the penultimate weekend of the season could be key, although they will hope to be planning for another season in the top flight by the time the Billy Goats visit the Coface Arena on 16 May. With only ten points to make up - like Mainz - to reach presumed safety, Peter Stöger's side will be pretty confident of keeping their heads above water. With Anthony Ujah hitting form lately and resolving a goalscoring crisis which had seen the club draw no fewer than five of their home games without scoring, there is justifiable reason for optimism. Their next three games could prove decisive and even three draws from games at SC Freiburg, at home to TSG 1899 Hoffenheim and at Hertha Berlin would probably suffice to keep an adequate cushion over the bottom three. Thanks to goalkeeper Timo Horn, who has had a spectacular first season in the top flight, Köln have conceded fewer than any other side below the top five and that should lay solid foundations for another season in the big time. There may only be one point between Hertha Berlin and the two teams ahead of them, but there was a much bigger gulf up until Pal Dardai took charge of the situation and, with eight points from their last four games, helped lift the Old Lady up and away from immediate relegation danger. Of the sides scrapping it out, Hertha are in arguably the best form with Salomon Kalou's return to the starting XI helping to inspire their climb. They have developed more resolve too under the Hungarian national team coach, showing no fear of high-flying Schalke or Augsburg, which stands them in good stead for when they have to travel to Bayern, host Borussia Mönchengladbach and face Borussia Dortmund between Matchdays 30 and 32. By then, they will hope to have left the bottom three at a long arm's length. One for all and all for one is the musketeer call coming from Hanover with the Lower Saxony club giving their public backing to coach Tayfun Korkut in what is the most difficult moment of his coaching career. The Reds have slipped to within two points of the bottom three, but a demonstration of defiance and faith in the coach means some of the pressures of being in such a situation have been lifted. The news of Lars Stindl's summer transfer to Borussia Mönchengladbach may have an unsettling effect, even if both the player and his club insist it will not. He is the most creative cog in this team and the 96ers will be relying on him to halt a slide caused by picking up just three points since the turn of the year. Experience could be the ace in the pack for Freiburg as they head into a third relegation battle in the past four seasons. Aside from their extraordinary push for a place in the UEFA Champions League two seasons ago, which collapsed only in the final game of the season, the Black Forest side are used to being involved in a battle for survival and coach Christian Streich has already saved them twice. As the saying goes, all good things come in threes and a 2-0 win over FC Augsburg on Matchday 26 showed all of the battling qualities Streich is so often able to eke out of his team, who will be looking for the Schwarzwald-Stadion faithful to act as their 12th man again when Köln, Mainz, Paderborn and Bayern pay the most compact and consequently intimidating stadium in Germany's top flight a visit. Hamburg have hit the panic button after dropping into the bottom three, making their second managerial change of the season. Peter Knäbel will lead the northerners into the final eight games of the season after Josef Zinnbauer was relieved of his duties. Knäbel is not a stranger in Hamburg having overseen the recent developments as director of football. However, his first coaching position in 15 years could hardly be a more daunting one. Without a win since Matchday 20, a stretch of results which includes an 8-0 loss at FC Bayern, he must find a way to get his team scoring again. The Red Shorts have found the back of the net only twice in their last six games, but as a goalless draw in a friendly against VfL Osnabrück showed, miracles cannot be expected overnight. Perhaps the one advantage Paderborn have over their rivals at the bottom is that everybody - even they - expected them to be in this predicament heading into the final straight. Relegation for the East Westphalian side would not be as damaging as it would to their illustrious rivals and league table neighbours, which means they can go into the last eight games without any pressure and with the defiance that has characterised their season to date. The eternal underdogs, as their coach Andre Breitenreiter never tires of repeating, will be looking to create a few more upsets with bottom-placed VfB Stuttgart the last due at the Benteler-Arena for what has the makings of an intriguing final-day battle. For the second year running, Huub Stevens is on a mission to save VfB Stuttgart from slipping into Bundesliga 2. The Dutchman is battle-hardened and, as a comeback victory over Eintracht Frankfurt on Matchday 26 suggests, this appears to be rubbing off on his team. That 3-1 success was a vital morale-booster, but with a trip to Wolfsburg to come followed by games with Europe-chasing Werder Bremen and Augsburg, it is time for Stuttgart's boys to become men with time running out in the Swabians' second successive survival struggle. Picking up only a few points from those three challenges would keep Stuttgart in contention for when they host SC Freiburg, while with two of their last three games at home, the Mercedes-Benz-Arena could play an important part in defining their destiny.